Hear me out....in my opinion, some of the best high school football in Northeast Ohio is played right here in Wayne County. Backyard rivalries are held weekly, and multiple county teams qualify for the playoffs year in and year out. So why not have a showcase football event that the entire county (and a segment of 2 other counties) could be a part of? I'll tell you why I think it's a no-brainer, and you'll have a chance to tell me why I'm crazy for even suggesting it. First off, this isn't a new idea. There was an all-star game held from 1990 through 1994 that pitted Wayne County versus Medina County. The 1992 game was held in Orrville. Wayne County won the final game in 1994 held in Wadsworth, their only win of the series. The game was marred by a bench clearing brawl (maybe one of my readers can shine a better light on this). The series coincidentally was ended after the 1994 brawl, and Wayne County has not participated in an all-star football game since. My idea in a nutshell, divide the county into East and West....that would give you 10 teams....seems like enough right? Sort of, the monkey wrench comes in the form of the Hillsdale Falcons, who reside in Ashland County, but are a part of the Wayne County Athletic League....so they must be included. Now you have 11 teams, an odd number, so a 12th team is needed. Sitting down in Holmes County all by themselves are the West Holmes Knights. As the only football school in Amish country, I'm sure they'd be more than willing to participate. One third of their schedule is against Wayne Co. teams so they'd be a nice fit. Now you have 12 teams....the 8 teams from the WCAL, the 3 teams from the OCC, and Triway. If you're going strictly by geography (Route 3 & 83 seems to be the dividing line), here's how the county would be split and what division each school currently resides in. Quick glance says that the West team has a more proportional distribution of teams (1 from D2, 1 from D3, 2 from D4 and 2 from D5) whereas the East team has no team bigger than D4. I think the more tradition rich schools come from the East part of the county. So each side has something going for them.....let's call it fair and move on to the important details. The logical location of the game would be Wooster, and with the college's John P. Papp stadium getting fresh artificial turf (sorry...field turf), it's a natural fit, and there's no worry about the field getting torn up. The game should be held sometime in mid-July (after the 4th but before kids leave for college), and the game should definately be held at night, to avoid being played on a 95 degree day. As far as coaches, I think it should rotate, 2 head coaches per team, so basically, every coach will have a shot at coaching in this game every 3 years. Those coaches, along with a small committee of local media (...meekly raises hand...) should be in charge of doling out the invitations to recently graduated seniors sometime in the late spring. An effort should be made to basically include every athlete that was named to the Daily Record All-Star team. Each team should have somewhere in the neighborhood of 30-35 players, meaning each team would send 5 to 6 players. I think that's a real solid number, there's still some exclusivity, but totaled up, somewhere between 60-70 graduated seniors will have an opportunity to suit up one last time. 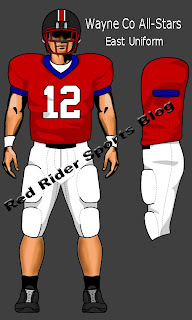 Speaking of suiting up, let's talk uniforms. 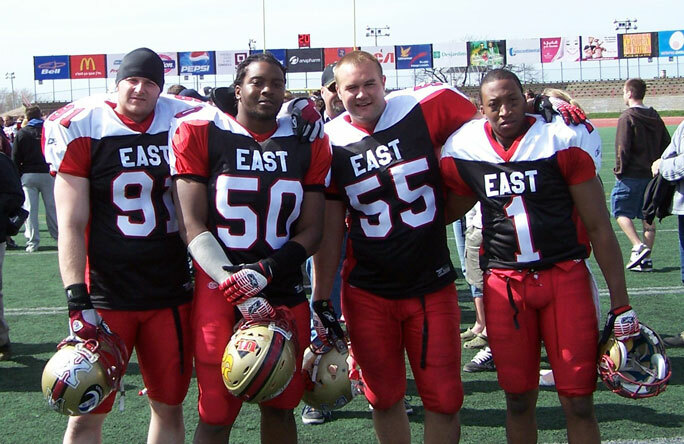 Here's a picture of the all-star game that was played over in Canton last month....the uniforms are very rudimentary, but at least everyone looks like they're on the same team. Plain white pants, all-star jersey and team issued helmet. 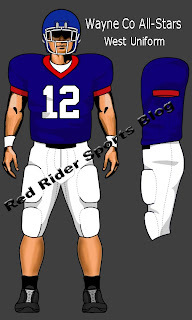 Here's what I envision the jerseys looking like, nothing special, but always nice to see it on paper. About the helmets, a lot of all-star games turn into mashup projects for the helmets worn by participants. Check out this pic (pay attention to the helmets) and this one. Tell me it wouldn't be fun to see the combinations that would come from this. A Smithville decal on an Orrville helmet? The Wooster 'W' on a purple Triway lid? The possibilities are endless. Except for Dalton and Orrville who have no decals to speak of (unless you coulnt Orrville's award decals). So we have the teams, coaches and uniforms. What about the fans? Easy enough...sell color coded tickets to fans from every participating school for $5 each. The school that brings the most fans gets a small award to their schools Booster Club. Nothing much, $500 or so. Band? Nah. Maybe at halftime, there's a quick skills competition by some of the players, or even a few fans picked from the crowd via 50/50 drawing to compete in something. I also think that 1 athlete from each team should be recognized with a small scholarship (again, nothing more than $500 or so). This could also be done at halftime. I also think it would be a great venue to plug the Wayne Co. Sports Hall of Fame. Maybe during induction years, the inductees could be announced or listed in the programs. Great way to plug the upcoming induction dinner. After the game, allow fans on the field, do a team trophy and MVP presentation....and you're done. Of course, sponsors would be needed for the uniform cost and other costs associated with the event (programs, trophies, officials..etc.). If businesses/individuals from each participating town pledged $1000 (from one source or a hundred sources)...I'd think you'd have more than enough to cover expenses. I do think this needs to be a totally not-for-profit venture. I'm sure there would be no problem finding local charities to benefit from this game. Maybe rotate it yearly among several local charities. So...that's kind of it. That's my case for the game. Now it's your turn....tell me why this is a good idea, or the worst idea ever. We have the Wilbur Berkey classic for Wayne Co. basketball, why not the football equivalent? I think that's a good idea. No, a GREAT idea! I think you have nailed down some of the key points in your comments. The teams do seem even, with Orrville and Smithville on the same side, and the other being slightly bigger schools. But it's good that Orrville and Wooster are on opposite teams, since Orrville probably has the best athletes, and Wooster is the biggest. For halftime, instead of fans or players, why not have a mini punt-pass-kick competition for the youth from participating schools? Maybe limit registration to one kid per school; and as long as it's organized, it could be completed within 10-15 minutes. Then each school's representative gets to wear one of their school's practice (or real) jersies for the competition, which I think would be neat for the kids! Good idea, and I'm interested in what others have to say. I'm sure you could mention this blog to Aaron Dorksen or Mike Plant, and it'd get a mention with as slow as news has been lately. I don't like All-Star games because many times hard feelings are made between those that feel they should have made it and those that did. It isn't worth it, imo. Can you pinpoint a date when that brawl occured after the Wayne-Medina football game? I would like to look up the newspaper articles for old times sake. Thanks for the feedback. The article in the ABJ published on 6/18/94 that referenced the brawl...I'd have linked to it but there was a cost involved. Thanks for the feedback. A punt/pass/kick competition thing is a nice idea. And I sent the link to Dorksen at the DR...we'll see what comes of it. If its in the microfish at OPL, BRF will find it. Schedule the game to take place the week of the State Championship games. This gives any college scouts that are in the area an extra game to check out and possibly discover some hidden senior talent. Could take place on Thursday night. The focus should be on getting the seniors a chance to further their education and playing days after high school. This will also help get coaches and the communities on board. Not only that, but the area is still in football mode at this time and readily available to continue through one more week of practice and a game.